Guru Pradosham is a fantastic opportunity to reset your life. Spiritual practices on this day can clear previous negative karma that has been blocking the blessings or grace of your Guru reaching you. This Pradosham window is your chance to open yourself to fresh teachings or lessons from teachers, educators, mentors, or wise persons who can counsel you. Not everyone is afflicted by a Guru’s curse. However, if you are, you may have experienced that no matter how smart, how educated, or how well-connected you are to your network, until the Guru’s curse is removed, you may never grow in life. Participate in Guru Pradosham Poojas to eliminate any blemishes in your relationship with your Gurus (Teachers). The medium-sized crystal Shiva Lingam will be energized in the Guru Pradosham rituals. Lord Shiva is conceived in his unborn, invisible form as the Shiva Lingam. The Lingam represents the male creative energy of Shiva, or cause, and is worshipped as the Supreme Consciousness or Highest Intelligence. An Anointing/Hydration Ritual/Abishekam to the Shiva Lingam performed at special times helps dissolve your karma. Please Note: Your energized medium sized crystal Shiva Lingam and Prasad will be shipped from Chennai, Tamil Nadu. Please allow 2 – 4 weeks for delivery after the entire set of rituals is performed. 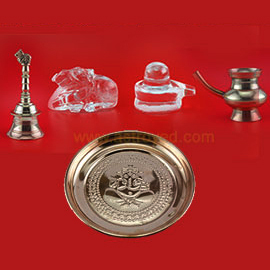 The Pradosham Pooja Kit, which includes a medium crystal Shiva Lingam, a small copper plate, crystal Nandhi, and a small copper kettle along with a bell, will be energized in the powerful Guru Pradosham rituals. You can use this pooja kit for performing Pradosham rituals. Participate in the Essential Rituals for Guru Pradosham. Shiva is the archetype who destroys the negativity that limits growth and success, and Pradosham, the 13th Moon, is the most powerful time to receive his blessings. 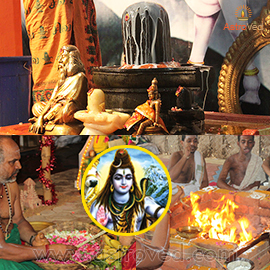 Our Vedic specialists will perform Hydration Solution ceremony to call upon the energies of Shiva and his sacred bull. Special archana to Narasimha will be performed at AstroVed Remedy Center. During Pradosham time, archana to Shiva at His powerspot will be performed to absorb your negative money karma that causes debt. You will receive the kum-kum (Red Vermillion Powder), which will be blessed in the rituals. Keep this on your meditation altar and wear it on your forehead during meditation or at other times to expand the Divine blessings into your life. 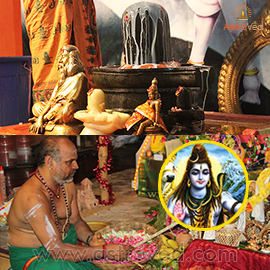 Our Vedic specialists will perform Hydration Solution ceremony to call upon the energies of Shiva and his sacred bull by chanting Laghunyasam Rudra Prasnam and Chamaka Prasnam (Vedic mantras recited to purify mind, body and soul) at the AstroVed Fire Lab and Remedy Center Guru Pradosham day. Special Archana to Narasimha will be performed at AstroVed Remedy Center followed by Bilva leaf Archana to Shiva chanting Rudra Trishadi (300 names of Rudra) will also be performed on March 29th(IST). The most terrible karma is destroyed when a Bilva leaf is offered to Lord Shiva. Light and sound offerings (Archana) will be performed to Archetype Shiva and Jupiter at their powerspots. Group fire lab to Shiva will also be performed at the AstroVed Fire Lab and Remedy Center the powerful Guru Pradosham day. 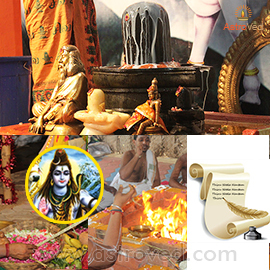 Participate in the Elite Rituals for Guru Pradosham. Pradosham times are the windows of opportunity when you can seek the blessings of Shiva to remove the karma or karmic energies that limit our potential in this current life. Invoking the energies of Shiva through an Abishekam and Archana, along with a group fire lab, will help you connect with Shiva, who absorbs negativities to expand possibilities for growth and abundance. Mantras connect people with the spiritual forces associated with planets and celestial beings. The quantum sound frequency THIRU NEELA KANTAM invokes the energies of Shiva, in the form of a blue light. The mantra literally means “Blue-throated One,” referring to the legend of Shiva drinking the poison that was going to ruin the nectar of immortality, and in the process his throat became blue. This mantra invokes the energies of Shiva in the form of a blue light, which removes karma and repetitive negative patterns.